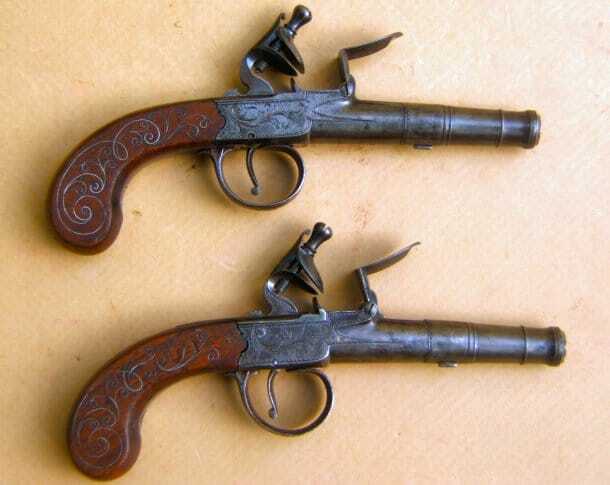 A FINE PAIR OF REVOLUTIONARY WAR PERIOD SILVER-WIRE-INLAY ENGLISH FLINTLOCK TURN-OFF PISTOLS, ca. 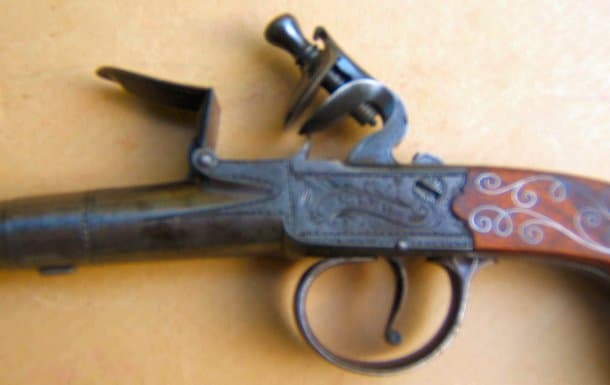 1775:In overall fine+, original flintlock condition. 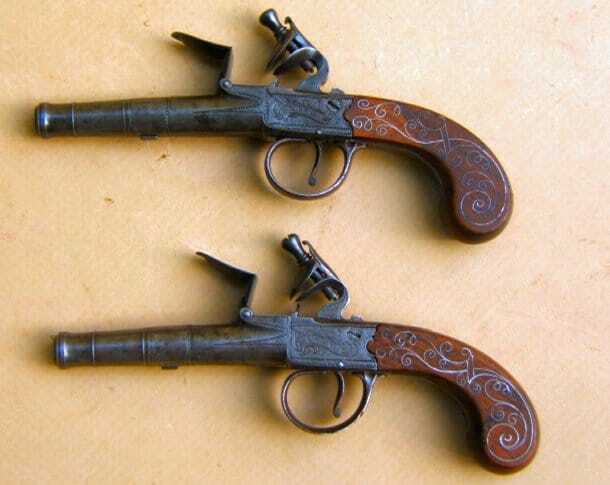 Round, 2 1/2″, Turn-off, cannon-form, baluster-turned, smoothbore, .45 caliber, iron barrels with two early Birmingham black-powder proof marks, on their undersides. Finely engraved, central-hammer boxlock, flintlock mechanisms with “KING” maker’s signatures: sliding trigger-guard safeties and hound’s-tooth-engraved central hammers and frizzens: one hammer with a nearly undetectable old repair. Both in mechanically fine condition with strong mainsprings and frizzen springs: functional safeties. The sides of the frames with matching borders, finely engraved scrolls and clear maker’s signatures. Smooth, steel gray surfaces with sharp engraving, 85% finish and very light patches of discoloration. Engraved iron trigger-guards with matching smooth, steel-gray surfaces and etched bows. Nicely figured, bag-shaped, walnut grips with some minor handling marks, sharp contours and 85% finish. Extensively inlayed with silver wire scrolls of classic Georgian design (99%). In overall fine+ condition. The barrels with good bores, smooth surfaces and a fine patina. The frames with sharp engraving, clear markings and matching surfaces. Very Fine grips without cracks or significant blemishes: retain virtually all of their silver wire. 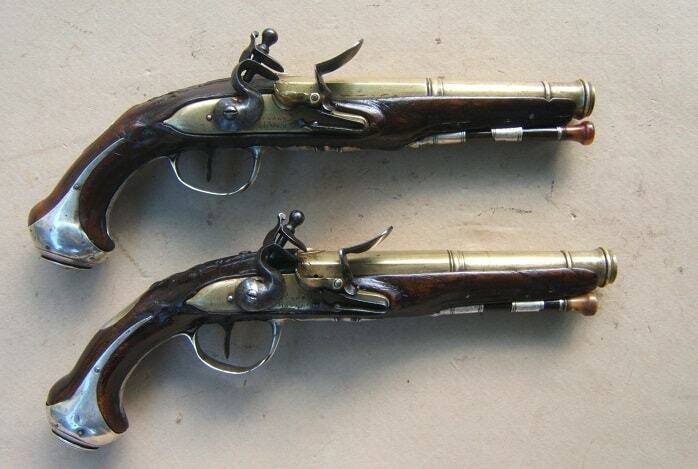 A very nice Pair of Revolutionary War Period English Boxlock “Queen Ann” Pistols, ca. 1775. Overall length, 8″.